Used to vent engine through valve cover and fill engine with oil.. A nice breather replacement is Kirban's K&N style Oil Fill Tube, Breather and Silicone Seal kit. It is recommended that you set the TPS at .42-.44 volts at idle and > 4.75 volts at WOT. The TPS provides a voltage signal that changes relative to the throttle valve. It is one of the most important inputs used by the ECM for fuel control. 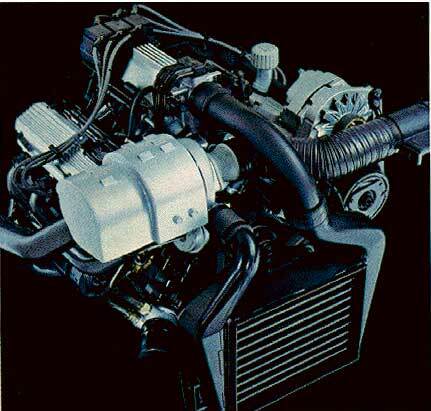 The purpose of the IAC valve is to control engine idle speed, while preventing stalls due to changes in engine load. You should clean the IAC and set to specs if you are having idling problems. This assembly sets the turbo boost at a precalibrated level. An adjustable actuator is highly recommended. You can make yours adjustable for a minimal cost. Never operate the cranking motor more than 30 seconds at a time without pausing to allow it to cool for at least two minutes. Overheating, caused by excessive cranking, will seriously damage the starter motor. The recommended oil filters to use are the PF-52 and PF-47. These are anti-drainback type filters. See the basics file for more information on routine maintenance of your Turbo Regal. Shield is used to protect turbo and act as a heat dissipation device. This unit is used to cool down the compressed air before entering the intake manifold. Replacement coolers can be purchased to greatly enhance performance. The CCCI system consists of ignition coils, ignition module, ECM, "hall effect" cam and crank sensors and connecting wires. The crank sensor is mounted at the harmonic balancer and the cam sensor at the camshaft gear. This distributorless ignition system uses a waste spark method of spark distribution. This hose is used to connect the intercooler to the intake manifold. The wastegate solenoid allows the ECM to increase turbo boost beyond the precalibrated wastegate actuator level. These are covers for the valve train assemblies. This unit is utilized to hold Injectors, Throttle Body assembly, EGR module, IAC solenoid and PVC valve. Stock down pipes connect into a single catalytic converter exhaust system. This engine uses a Mass Air Flow sensor. The MAF sensor measures the flow of air entering the engine. This information is used by the ECM for fuel control. This hose connects the MAF to the inlet side of the turbo. Make sure this is tightly connected and does not have any rips or holes. All 86/87 Turbo cars came with air conditioning. This Cycling Clutch Orifice Tube refrigeration system is designed to cycle a compressor on and off to maintain desired cooling and to prevent evaporator freeze. G Series R-12 charging capacity is 1.48Kg (3.25 lbs.) R-12. The regulator is a diaphragm-operated relief valve with Injector pressure on one side and manifold pressure on the other. Its function is to maintain a constant pressure at the injectors at all times. An adjustable regulator is highly recommended. Base line settings should be 36-40 lbs with vacuum hose disconnected. These lines feed oil to an oil cooler located inside the radiator. The turbocharger is basically an air compressor or air pump. It consists of a turbine or hot wheel, a shaft, a compressor or cold wheel, a turbine housing, a compressor housing, and a center housing which contains bearings, a turbine seal assembly and a compressor seal assembly. Turbochargers are used to put more and denser air into the engine combustion chambers. Because of the increased volume and weight of compressed air more fuel can be scheduled to produce more horsepower from a given size engine. A popular upgrade for these engines is the turbo upgrade. The fuel rail is mounted to the top of the engine. It distributes fuel to the individual injectors.